Drew Goddard co-wrote and directed the movie Cabin in the Woods, which was one of my favorite movies of that year. When I heard that he was writing and directing the new film, Bad Times at the El Royale, I was excited and was looking forward to it. I was completely engaged with the story being told in Bad Times at the El Royale as well as the manner in which it was told. Now the story was fairly complex as it involved a group of unlikely characters arriving at the hotel named El Royale, which was found directly on the border between California and Nevada, with motives of their own and a ton of secrets. The acting is unbelievable in this movie. Jeff Bridges is given the deepest, most interesting character on the page and he brings it big time. Jon Hamm is great as Laramie Seymour Sullivan who is not quite what you expect. Chris Hemsworth is fantastic in a menacing role that is different than anything else he has ever done. Lewis Pullman shows all kinds of soul to the seemingly only staff member at the hotel. Dakota Johnson whose character is deeper than it appears. However, there is no doubt who steals this movie. Cynthia Erivo has a star making performance as Darlene Sweet, a singer who has come to the El Royale the night before she is scheduled to perform at a club in Reno. Erivo is a well respected stage actor and she has a Daytime Emmy Award, but this is one of the biggest performances on the big screen you are going to get. Her vocal performance alone is mesmerizing. The connections she makes with Jeff Bridges are some of the best moments in the script. The film has a feel of a Tarantino movie, in both structure and development. I felt as if I were watching Pulp Fiction. That is a high complement. Another thing that made me think about Pulp Fiction was how every question brought up by the film is not answered. I understand that will probably upset some people (like those people who felt as if LOST needed to answer more than it did) but I like that. There is one plot specifically involving a film recording that might make some people crazy. The only issue I had with the film was it did drag a little early as things were being set up and it could have been a little long. However, the third act was as good of a third act as you are going to get and it was completely original. 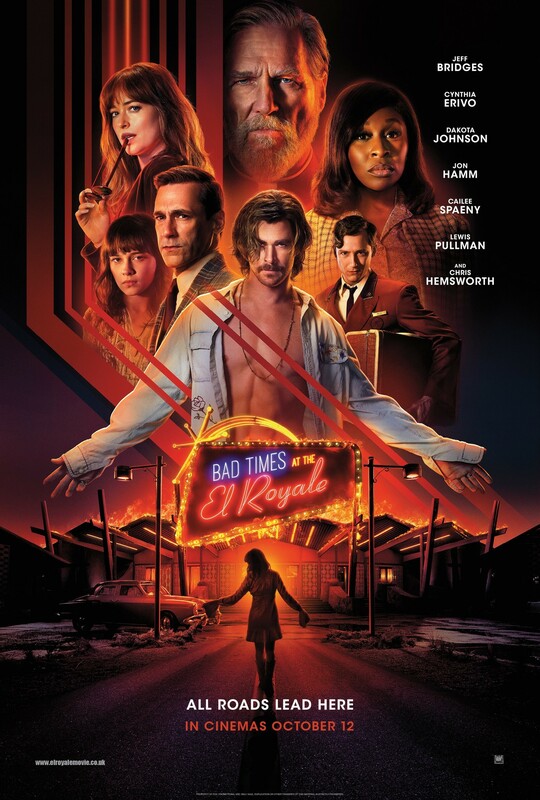 I was thoroughly entertained watching Bad Times at the El Royale and I think it is one of the best films of the year. It was full of great acting, great storytelling and some of the best looking shots you are going to find. The mystery of the story is compelling and engaging. Jeff Bridges and Cynthia Erivo do some of their best work, which is saying something. Chris Hemsworth makes one of the best villains of the year. Bad Times is full of Great Times.